August 13th, 2018: Cities across the US are suddenly having to deal with an influx of “new mobility” transportation modes they haven’t seen before—electric scooters, untethered shared bicycles, and continually evolving forms of ride-sharing. Here in Wisconsin, the City of Milwaukee has banned the electric scooter operator Bird from deploying its vehicles on city streets due to a Wisconsin law that renders them illegal. Other cities in the region are grappling with these changes—and are often unsure of what to do. 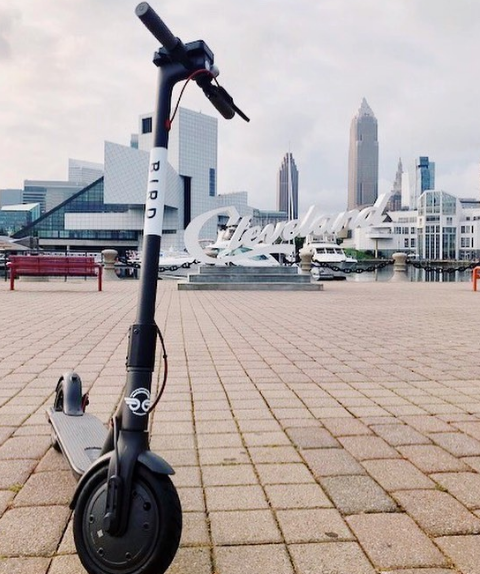 Public reaction has been mixed—while many feel like the “new mobility” modes clutter up the city and make the streets less safe, others have been quick to embrace them—people in Milwaukee appear to be willing to risk $100 fines to ride Bird scooters. Here’s our take on the issue: our cities are still overwhelmingly car-dependent. For decades we have turned over valuable urban land over to the transport and storage of automobiles—leaving very little space for other modes, whether it is walking, biking or public transit. This choice has come with serious externalities—huge cost burdens on people forced to own a car for accessing jobs, thousands of people killed or seriously injured as a result of traffic crashes, poor air quality from particulate matter emissions, increased housing costs as a result of expensive mandatory parking being provided, and productivity losses from long commutes or being stuck in traffic. The new modes appear to be filling consumer demand for cleaner, lighter, smaller and faster ways to travel, without having to worry about all the actions it would take to drive. While these options are by no means the only solution to transportation issues—they do represent a change in how people are viewing personal transportation. This is significant—because an equitable, low carbon transportation system in the future will require a culture shift that prioritizes the movement of people over cars, and treating urban spaces as valuable cultural assets that are central to community. Instead of banning new mobility options outright, here’s what cities can do—first proactively understand the values of their communities, and distill them into forward-thinking transportation plans that leave enough flexibility for potentially disruptive transportation options. Cities must take ownership of their rights-of-way, and offer regulatory guidelines for entities that wish to use these public spaces. They must also ensure that these companies do not exacerbate existing racial and economic inequities—for example app-based car sharing services continue to operate without having to abide by ADA laws. Using all of these services requires the use of a credit card and access to banking infrastructure that often leaves out those historically marginalized. Communities of color must be at every decision-making table when it comes to making future transportation investments. Finally, it is important to remember that even as new technology floods in, there are several common sense, tried and true solutions to building better transportation systems. These new options can only be successful if supported by a strong network of existing core priorities. These include investing and prioritizing public transportation as a valuable community asset and building mixed use and affordable housing alongside, creating safe walkable and bikeable infrastructure and ensuring that roads and streets are maintained well instead of pushing for wasteful highway expansions.